How does the RAS bow sight work? How does the RAS bow sight mount to my bow? How do I calibrate the RAS bow sight? To calibrate the RASp1 bow sight is very similar to sighting in with traditional pins. By pressing the bottom button for 3 seconds the sight will go into 'CALIBRATING' mode which will ask for 'RANGE 1". This range will be at around 10 to 12 yards. Aim the sight to the target and range. The sight will then display the range and give two options to either store this range or range again if the target was missed by the range finder. If range is correct press the bottom button. Aim and shoot an arrow to the target by aiming with illuminated LED. If the point of impact was low adjust the LED's by pressing the bottom button. For each press of the left or top button the LED's will either go up or down. If the point of impact was high press the top button once and shoot another arrow. Repeat this process until the arrow is on target. When the arrow is on target press the bottom button for 3 seconds 'RANGE 1' will be stored. The next option will be 'RANGE 2' this will be at around 20 yards. Repeat above steps for 'RANGE 2' until 'RANGE 5' is calibrated. Example of range calibration if maximum shooting distance is 70 yards and only 5 RANGES are saved. Remember that 'RANGE 5' must be at the maximum range for where you will shoot comfortably in this example. Ten different arrow types can be calibrated into your P.A.P Bow Hunting Sight example: Blunt point for practice, 2 broad heads for hunting at different came species and an arrow for foaling etc. NEVER SHOOT OVER MAXIMUM CALIBRATED DISTANCE AS THIS WILL RESULT IN POSSIBLE MISSED SHOTS. When your RASp1 Bow Hunting Sight is calibrated you are ready to go hunting. The sight works from a Lithium Polymer battery and could be charged from any 5v USB power supply. The battery will last for at least 8 hours of use. Charging the battery will take around 3 hours. The sight is equipped with a built in power saver that switches of the sight after 5 minutes if there where no activity. The sight will also go into a low power consumption mode after 25 seconds of no activity. The screen will still be displayed and also the range LED. If the user want to range he can only aim and press the top button on the switch extension cord. Is the RASp1 bow sight available in right or left hand? At this time the bow sight is made to fit a right-hand bow only. Is the RASp1 bow sight legal to use on my bow? clean kill of game. The individual state wildlife agencies determines what bowhunting equipment is allowed and what is prohibited or restricted. This is a list of states that allow electronic devices to be used on a bow. It’s always best to check local equipment regulations with the state agency prior to bowhunting in that state. sight pins are allowed in most states. NOTE: the RAS bow sight doesn't project a light on to the target, but is considered to be electronic with calculations. The new RASp1 bow sight hopes to help all bow hunters make a more ethical and precise arrow placement. The RASp1 bow sight is legal in all states for recreational archery and target shooters. Always check with your state's local DNR or Wildlife Department to know your legal rights. What comes with my new RASp1 bow sight? The RASp1 Laser Rangefinding bow sight, mounting bracket, charging cord and AC adapter. What are the specifications of the RASp1 bow sight? What are the advantages for using the RASp1 bow sight? Combines pin sights and rangefinder into one unit. Calibrates the trajectory of my arrow on my bow. Gives me the correct sight marker at all ranges from my closest to my maximum target automatically. Allows me to calibrate the trajectory of multiple arrow weights. Stores all of your custom calibrations for future use. Eliminates guessing between pins for the correct sight marker. Calculates the true range automatically when shooting uphill or downhill. Can be programmed for multiple shooters. Can scan a target and automatically give the correct sight marker when the target stops. Reduces the amount of movement required to range and select the correct target marker. Reduces the chance of an inaccurate shot placement by giving correct sight markers for exact ranges. No need to hold over or under a target on angle shots with the correct sight marker selected automatically. Chances for a more accurate arrow placement means a more ethical shot are improved. Having the correct sight marker for each shot will make me a better and more accurate hunter. Does the RASp1 have the ability to make adjustments for angle shots? 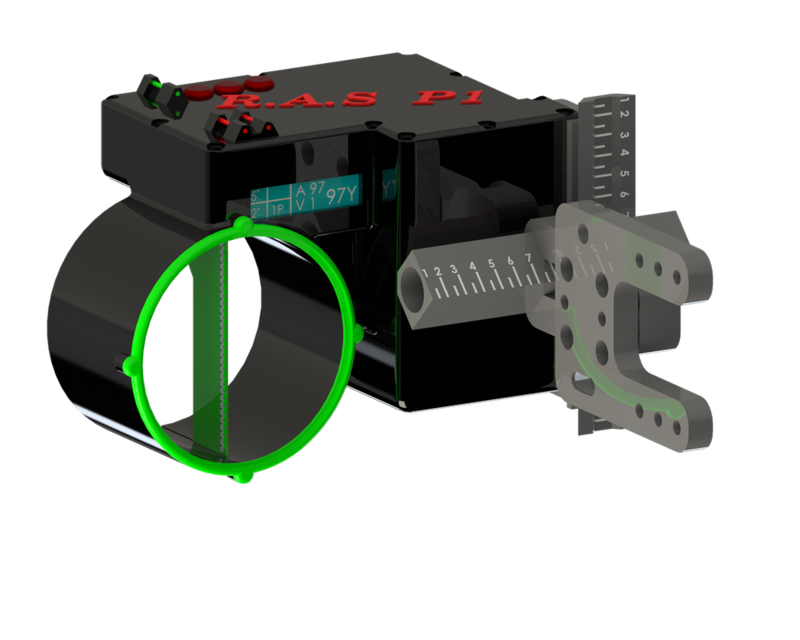 The RASp1 laser rangefinding bow sight has AFT (Adjusted Flight Technology) or the ability to make adjustments for incline and decline when ranging a target. This allows the shooter to get an accurate range marker for that angle. No more aiming high or low to account for elevation to the target. Just RANGE-AIM-SHOOT because the RASP1 does the work for you! How can I order the New Revolutionary RASp1 Rangefinding Bow Sight? Place your order TODAY and be one of the first to own this revolutionary new concept in target acquisition!